Big news: I’ve managed to launch my own Destiny based website!!! I’ve been working on an inventory management system for a while now, and following on from my previous blog posts I’ve managed to deploy my work to date as a live website. You can test it out for yourself here https://www.destinyvaultraider.com once you’ve authorised your account, you can click on Vault, Character or Xur (if he’s around). The aim of this website is to use it as a live learning tool, where I can continue to develop and add new features. For example, I can display the vault and character inventory but I can’t transfer items yet, so this is a feature I hope to add in the future. Transfer items from your vault to your character and equip them. Reading a characters inventory and vault contents. Creating a Python web server with Flask. Authenticating our app with Bungie.net OAuth. 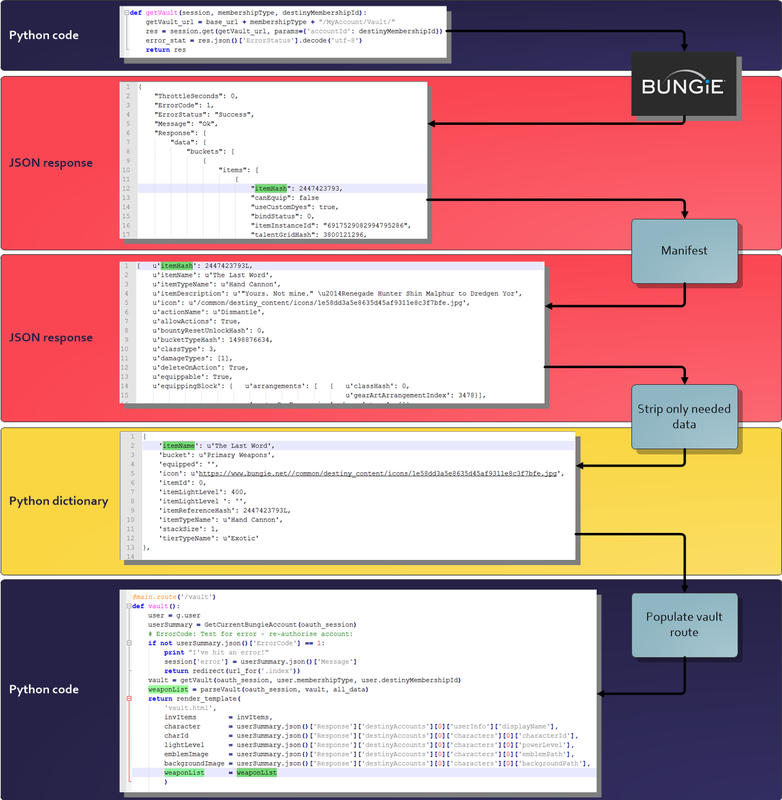 This section is quite confusing as I’ll be making a request to Bungie, then decoding that request and changing the format of the response a few times before plugging it into my Flask app, so here’s a quick guide as to how I’m creating the Vault route. Excuse the colours, I’m a representing Future War Cult. You can click on the image to make it bigger. In the previous section we created an index route, which was used to display the index.html page. Now that we have authorised the user, we can build on this and add a new route to display the users Vault contents. Right now, ‘vault.html’ is an empty file that extends from our ‘base.html’ – it will only display our navbar. For a quick refresh on the Flask setup, check out this post: Creating a Python app for Destiny – Part 7: Authenticating our app with Bungie.net OAuth. We are extending from the “base.hmtl” template and our content block is empty. Now we can build on this and add some content. 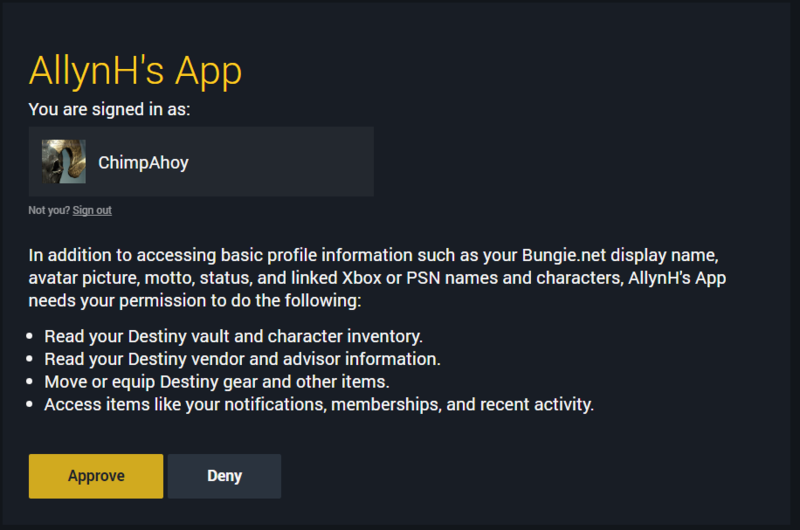 We need the users membershipType, destinyMembershipId and characterId. Send a request to Bungie.net to get the users Vault contents. We’ve already done this here: Creating a Python app for Destiny – Part 5: Reading a characters inventory and vault contents. Parse through the users vault contents and take out the data we wish to display. Again, we’ve done this above, we just need to tweak the code a bit. Categorise and display each item. The JSON response from Bungie doesn’t return the items in any order, so we need to categorise them in order to display them properly. Once the user has been authenticated by Bungie, we can send a request to Bungie to get the account details of the current user. This will return some important information like the users PSX / Xbox Live username, membershipType, destinyMembershipId, and all of the users character IDs. The response from getcurrentbungieaccount returns a lot of important account data. This Endpoint will also give character details, such as race, gender and class, details of the users clan affiliation, the users Grimore and more. Now that we have the users membershipType and destinyMembershipId, we can send a request to Bungie for their vault contents. 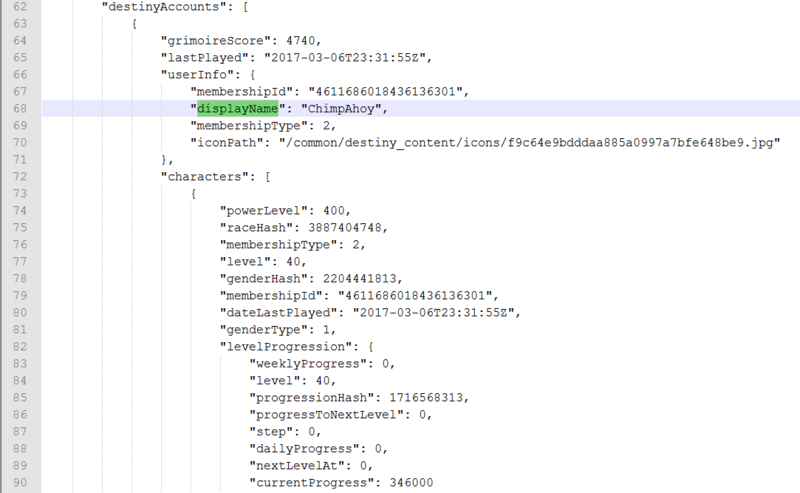 getVault_url = base_url + membershipType + "/MyAccount/Vault/"
Again we send a request, with the users membershipType and destinyMembershipId added to the URL as parameters, the the function then returns the JSON response from Bungie. Now that we have a response from Bungie, we need to convert this into a human readable format. The JSON response from the getVault request (in my case) is 35,147 lines of text… That’s a lot of data, also there is no real human readable data in there, it doesn’t return the item names for example – just a itemHash value. So we now need to strip out each item hash and search the manifest for the human readable format of that data. Again, the response after decrypting these items from the Manifest is 54,150 lines of text, so we’ll need to extract only the lines of code we’re interested in. Each item will be condensed down to 10 pieces of useful information (we can build on this at a later stage if needed). Decoding the itemHash from the manifest and stripping out the required data. One of the things we can also do, to make life a little easier for us, is to categorise each item by its “bucketName” – this is a value stored in the manifest that is used to categorise each item, for example “Primary Weapon”, “Consumables” or “Ghost”. The response from getVault is split into 3 buckets, “Weapons,” “Armor” and “Inventory”. 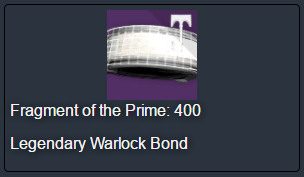 This can be seen when you visit your vault in the tower or on any app. In our case, we’re going to add them all to 1 page, with the ‘bucketName’ (i.e. “Primary Weapon”, “Chest Armor” or “Consumables”) used to categorise each item. Now that the list is created, lets loop through each inventory item, decode the values from the manifest and store the data we want to display. The JSON response from getVault shows the itemHash we need to decrypt. We are also going to query each “itemHash” from the manifest to get the full item details, you can read back to part 5 for a refresh on what I’m doing here. 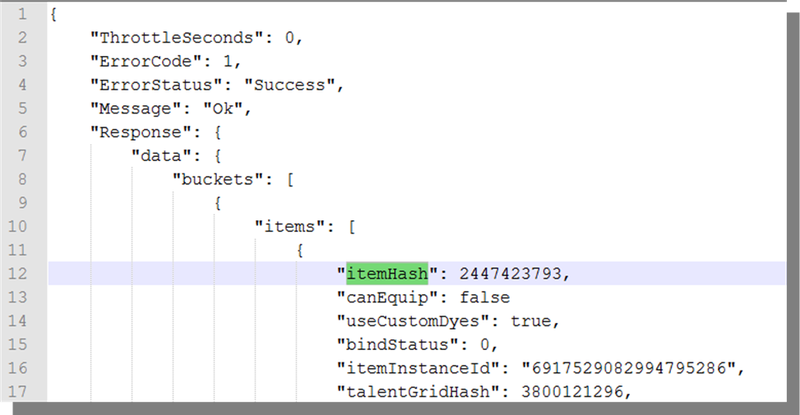 Once we have the “itemHash” we can query the Manifest definition “DestinyInventoryItemDefinition” for the item details. We can then store the information we want to keep in our own list of dictionary items. Also note, as I’ve hit a few issues recently with Bungie releasing new items – but forgetting to change them from “Classified” in the Manifest, I’ve added a default value for any items with an “itemName” of “Classified” – this will prevent any errors occurring if Bungie add a Classified item at a later stage. Now that we have stripped the important data out of the manifest, into a list of dictionary’s, we can pass this list to the ‘vault’ route in the ‘views.py’ file. As a side note, it would have been possible to populate the Vault route without stripping out this data – but it’s much harder to parse through lists of nested dictionary items in the Jinja2 template than in Python. Also, if we were creating a high traffic site, it’s not good practice to send large files of data every time the user refreshes a webpage. In the case of our Vault route, this could get to about 5MB per page view… Users on mobile data wouldn’t be happy about that, so we need to cut this down. Populating the Vault route in our Flask app with the data stripped from the manifest. Now that we have our important data stripped out and stored in a list of dictionary objects, we need to pass this dictionary to the render_template function of the vault route as a parameter. The “invItems” dictionary, containing the item categories is also passed as a parameter. 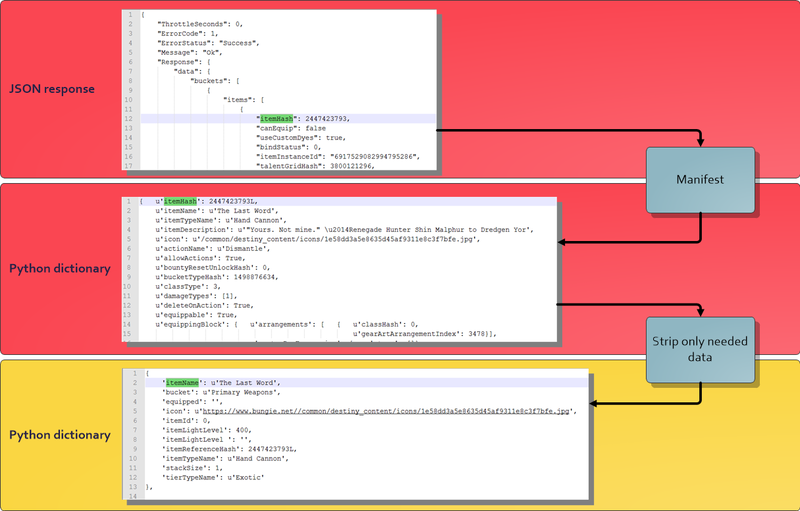 The other parameters (character, characterHash, charId, lightLevel, emblemImage and backgroundImage) are all taken from the response from getcurrentbungieaccount() and were shown in the last blog post, Part 7: Authenticating our app with Bungie.net OAuth. The code is quite basic, 2 <div>’s an <img> and 2 <p>’s. The first <div> sets out a Bootstrap column, col-md-3 will allow 4 images to be tiled, per row, before moving to a new row. For the image, I’m passing a lot of parameters but I’m not actually using them yet, as I haven’t found a tidy way to display all of the information. In the <p> paragraph sections, I’m displaying the itemName, itemLightLevel, tierTypeName and itemTypeName. Here’s what the output from the ‘itemBlock.html’ template file looks like. To display the vault contents in the correct order, we need to step through the invItems list and pick out each item of each category. If so we include the “itemBlock.html” file to display the item. There are a few files / folders, so you’ll need to download it from there. 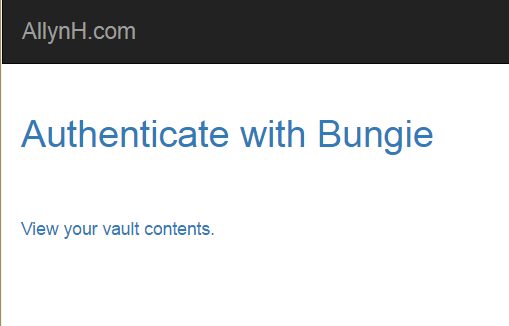 First, click on the “Authenticate with Bungie” link and follow the instructions to authenticate your account. Here is the view of the index page. You should see a screen like this, asking you to review and approve the permissions required by this app. Don’t forget to review what permissions your giving the app. You should then be redirected back to the index page. 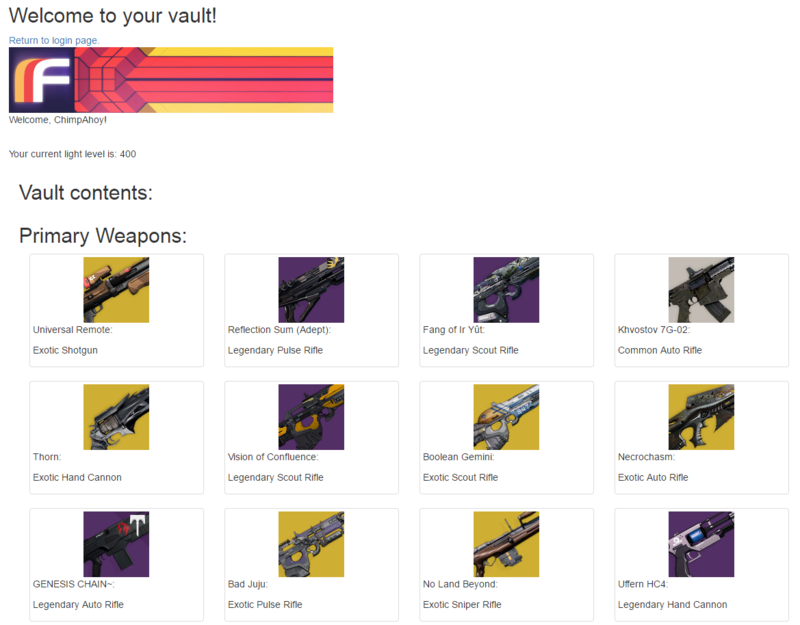 Here’s what the vault view currently looks like! Right now, we’ve created the basic shell of the website / app. This is a good start and we can build onto this, add features, create new pages. Finish the refresh token flow, so users don’t need to authenticate every 30 mins. Add a user database to securely store the users refresh tokens. Add a transfer item feature.